The sun was coming into the great room this morning and the quilts I have made for my grandson's soon to be new bedroom looked pretty just piled up there on my Mom's old orange chair that I love. 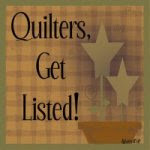 You can see previous progress on the quilts here. He will be having bunk beds in his room eventually so I made 2 scrap quilts. My quilter did a good job with the pattern she chose. She calls it Chestnut Swirls and I think it's perfect. It seems to pick up on the many paisley scraps that ended up in these quilts. Now I have binding to make and attach and once his room is painted and ready for decorating these will look good in a little boy's room. And perhaps he'll be sharing this room with his baby brother someday in the future, who will be arriving in July. I can't wait! I need to come up with a great baby quilt for him soon so got to get these old menopause wheels turning! I love your (Carter's) quilt. 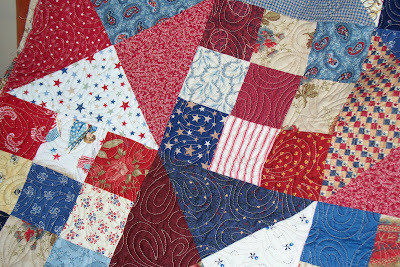 The blocks are fantastic and the Quilting is perfect. Very inspiring if I do say so myself. I'm sure he'll love those quilts! 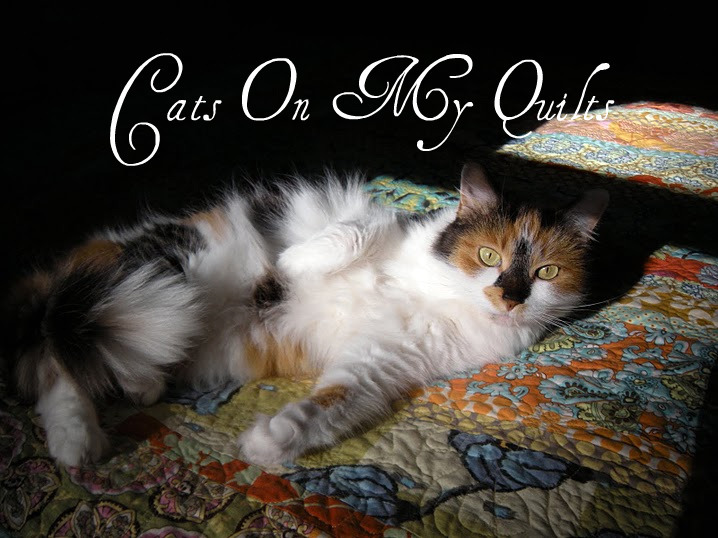 The quilt came out really great! He will love it, and it will certainly brighten up his room. Love the colors in Carter's quilts. My son had bunk beds when he was young and I made a red white and blue sailboat quilt for the bottom bunk. It needs repair now, but has always been one of my favorite quilts. 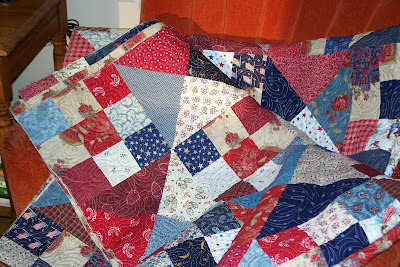 I love Carter's quilts--especially since I can see scraps from things of mine in it. There's some stars from my college quilt and pretty flower print from the back of my wedding quilt, and probably some scraps from American girl projects. Lots of love sewn in!!! I love those two quilts, they look perfect for a boy's room. Dont even mention the M word to me... I am 66 & still!! get hot flushes.